We are a group of Darien student-athletes (grades 1-12) interested in learning and competing in junior level squash. Darien Squash leadership is composed of parent volunteers interested in organizing and facilitating the efforts of the athletes. All coaching and training are provided by outside professional programs. Local, regional and national competitions will allow the athletes to compete with athletes from other programs. Darien Squash aims to challenge its athletes with continual instruction in a fun and active environment with the best interests of the athletes as the first consideration. Beginner players start with developing hand-eye coordination skills. There are many good ways to develop coordination, but the best of them involve fun games and activities built around attempting to catch a moving ball. As beginners progress they are ready to handle the weight of a small junior racket and are ready to learn to swing and hit. At this point, they learn to hit the ball, and with a little practice, they can soon direct shots to a specific target area using both forehand and backhand strokes. We try not to get caught up in too much technical instruction, but we do introduce the correct grip and learn the correct first position of the swing. As in all competitive sports, good sportsmanship is to be adhered to by all players during practice and matches. Good sportsmanship is a learned behavior and will be reinforced by the coaches and Darien Squash leadership. Parents can play a great part in having their children practice good sportsmanship by being positive role models. Squash is a sport that takes place within an enclosed court. All behavior is in plain sight of coaches, fans, and other players. 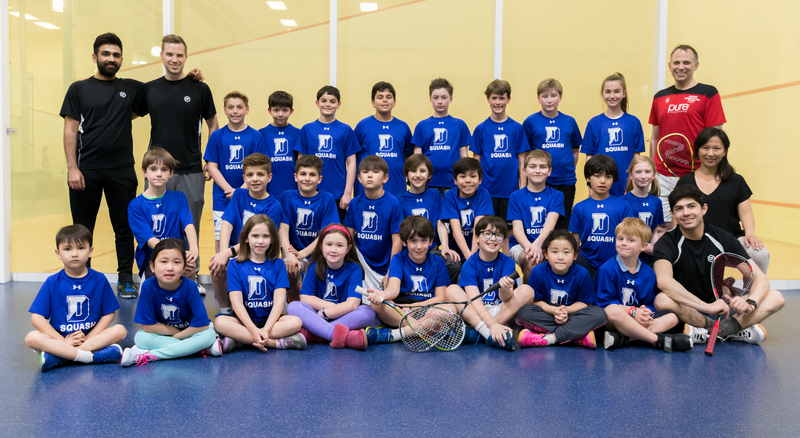 The Darien Elementary Squash Team is part of the FairWest Squash League which includes ~10 schools and ~400 players in the Fairfield-Westchester area. The FairWest League looks to grow their numbers, and provide a place for players of all levels—whether those who are top-ranked Gold/JCT competitors or just beginners—including private and public school students, to play and get better at squash. It is an outlet for squash players, who may not have the best team programs at their schools, to play more often and with other kids of their same level, or better.